Enterprise-wide management of code groups, also known as value sets, will be a requirement for organizations that embrace forward-thinking initiatives such as Accountable Care, Health Information Exchange, and Population Health and Analytics. Watch this webinar as we discuss the key challenges with managing code groups (including sensitivity codes) within today's healthcare environment. 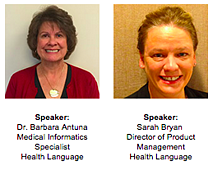 Dr. Barbara Antuna, Medical Informatics Specialist at Health Language, reviews clinicial examples of code groups. Sarah Bryan discusses the benefits of a code group management solution and how to maintain current, approved, up-to-date content for your organization.